arch: pacman -Sy wine . you can also try wine-staging for extra gaming features if you play other games but as far as I know development has stopped. the updater should say that it's installing in C:\Users\youruser\Local Settings\Application Data\osu! if you are on nvidia, check the proprietary driver's control panel and make sure there is no vsync anywhere enabled. if it's still limited, doublecheck your in-game frame limiter from the options. echo "options usbhid mousepoll=1" | sudo tee /etc/modprobe.d/usbhid.conf where 1 is the interval in milliseconds, meaning that 1 is 1000Hz, 2 is 500Hz and so on. you can now run xinput_calibrator with your tablet's name (id also works). don't do anything, just let it run to get the default area values in case you lose them. xinput_calibrator --device "HUION 420 Pen" Calibrating EVDEV driver for "HUION 420 Pen" id=11 current calibration values (from XInput): min_x=0, max_x=8340 and min_y=0, max_y=4680 in my case, the default area is 0 8340 0 4680.
rhel, centos, fedora: sudo yum install gcc "kernel-devel-uname-r == $(uname -r)"
xsetwacom allows more advanced area configuration on wacom tablets. you can map your tablet's area to a specific region of the screen instead of an entire monitor. This doesn't work on ubuntu 16.10, when the osu installer opens it doesn't render properly and everything is replaced with a red box outline. after osu tries to start it crashes every time. How would I fix this? @iamshapeless You will need to install gdiplus for that virtual drive :). Works on Linux Mint 18. Thanks! Unfortunately doesn't seem to run as well as it does on Windows (getting around 230-235 FPS rather than a straight 240 for some reason.) Still fun. btw you don't really need to mess with PlayOnLinux anymore, latest wine works without latency if you set audio to alsa instead of pulse WINEPREFIX=... WINEARCH=win32 winetricks sound=alsa. even if you use pulseaudio in your distro this will still work fine. Hello! I followed your instructions, however whenever I try to launch osu via POL shell the updater falls into an infinite loop. When its progress bar reaches 100% it exits and starts again in a few seconds. Could you please help me? I've been having the same infinite updater loop when I install, I have to copy some files from a working osu installation to get it to work. UPD:Hmm I manually downloaded and renamed the 15 .dll files and now its working. I'm getting this when installing dotnet from winetricks. I am running Ubuntu 16.04. Any suggestions? Edit: I fixed it with some weird stuff. I went into GUI with dotnet and tried to install it. It got stuck so I cancelled it and killed the installer. Then I went into wine's uninstaller and repaired the framework. It seemed to go through successfully. Turns out that you need to install lib32-gnutls manually because of a missing dependency in the wine package, or something like that. This solved the issue for me. Did you read the logs? Maybe you need to install the package? In my case was "cabextract" debian package. Yes I did read the logs, I had the error before and I fixed that. Im talking about after I fix that, and install it. Anyone have any clue what causes this? "Please check your internet connection"
My first installation was successful, but after a few days after the registration an account i recieved a restrict mode(maybe too many PP on new account, but i get email with multiacc ban reason). A few days later i recieved a loop message "Connection to bancho failed. Retrying in 30 seconds". 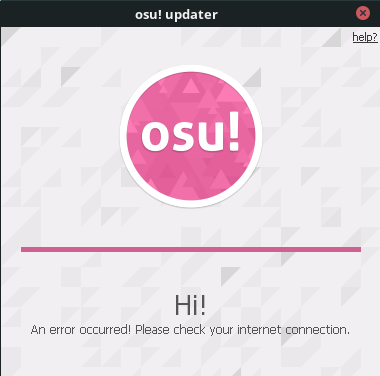 I decided to reinstall osu, but i could not do it because i got an error "Please check your internet connection". I tried different versions of wine (3.0.3, 3.15, 3.16), dotnet(45, 462, 472), and fresh system install(Debian, Manjaro) and got same result on any system/configuration. My computer blocked on osu servers? I tried to run installer with proxy, but it did not work. 003f:fixme:ras:RasEnumConnectionsW RAS support is not implemented! Configure program to use LAN connection/winsock instead! 0434:fixme:ras:RasEnumConnectionsW RAS support is not implemented! Configure program to use LAN connection/winsock instead! The link for https://gist.github.com/Francesco149/a2f796683a4e5195458f4bb171d88eb0#converting-your-windows-wacom-tablet-area-to-linux-wacom-only seems to be broken/dead. "Please check your internet connection" solved in virtual machine, it looks like my computer is banned on the server... I could not find a solution. 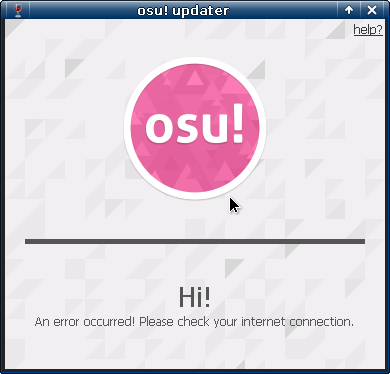 been getting this on the osu updater, what seems to be the issue? GnuTLS error: A packet with illegal or unsupported version was received. I'm getting a 403 forbidden whenever I try to install dotnet with the winecfg thing. For people having issues with the updater failing to get an internet connection with the message GnuTLS error: A packet with illegal or unsupported version was received. : This is because of a bug in WINE. Updating to WINE 4.0-rc1 or newer should resolve the issue. For people with An error occurred! Please check your internet connection., make sure 32-bit gnutls is installed. For arch, installing lib32-gnutls fixed it for me.